Good morning! Hope everyone's week is going well. I've got two projects to share with you today. I sprayed the background with Art Anthology Timeless, Warm, and Sandcastle Colorations. Once that was dry I stamped Magic Strands in black ink. I then stamped Drinking the Coffee on a piece of card and colored the coffee cup with a mixture of Art Anthology Fiesta Velvet and Black Leather Jacket Sorbet. I also stamped some extra cups and painted them with the same mix. 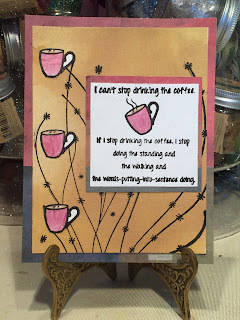 I mounted both the Drinking the Coffee cardstock piece and the background on a piece of multi-colored paper and adhered it to my card. 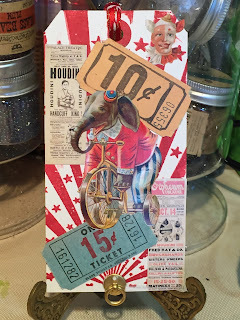 I stamped Circus Stars in Tomato Sauce chalk ink onto the tag. I then glued on various circus-themed elements and tied a piece of red and white striped string through the hole. Quick and easy. I hoped you enjoyed this two projects today.